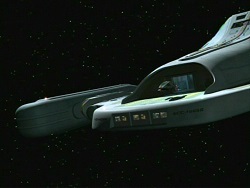 In the event of an emergency, Federation starships are capable of ejecting their Warp Core into space. Immediately after a potential Warp Core Breach is detected damage control teams will cut power to the Core and begin decoupling the dilithium matrix to try to stabilize the system. If this fails then Engineering is evacuated and safety bulkheads seal the area. The Commanding Officer, Duty Officer, or Chief Engineer will then initiate the Warp Core Ejection sequence through either voice command or keyboard command. The computer begins the ejection process. 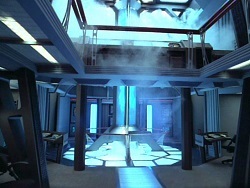 The exterior doors to the Warp Core are opened on the underside of the ship. Interior connections to the core are automatically severed and small, explosive charges detonate to propel the Core through the opened hatch. Once the Warp Core has been expelled the ship will engage its Impulse Drive and travel until it reaches minimum safe distance. Scans will be initiated to monitor the Core to determine its status. Engineering crews return to Main Engineering. 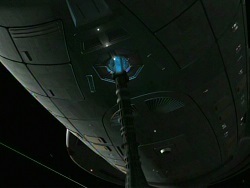 Efforts will begin to recover the Warp Core if it is able to be salvaged. 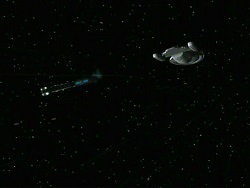 In the event that the unit is not capable of being repaired a distress call will be transmitted. For vessels equipped to do so work will begin on construction of a replacement Core. If the Core is salvaged it will be reconnected to the ship by Engineering at this stage.